Tailored Education and Training. Your organization's mentoring and coaching or tutoring and teaching needs may be met by topics presented on this page. Working with private, public, volunteer, and academic organizations, I have presented or facilitated hundreds of face-to-face seminars, workshops, meetings, and distance learning webinars. Each of the listed topics, that is, the specific content and the format in which they were presented or facilitated, was originally tailored to meet the needs of one or more organizations. Experience clearly indicates that education and training programs and facilitation efforts must be tailored to an organization -- “off the shelf” does not work. Topics that I have presented/facilitated are listed below primarily to suggest the variety of material that is available and the various means (e.g., face-to-face or webinars) that can be used to acquire additional knowledge and skill, resolve issues, or pursue opportunities. Perhaps some of these or similar topics, with carefully customized content, would meet the needs of your organization. Communication: Writing and Speaking to Make things Happen. A proposed one day hands-on, interactive workshop. Change: Can You Spare a Paradigm? Delegation: Why Put Off Until Tomorrow What Someone Else Can Do Today? Would Doing Art Make You an Even Better Engineer? Superior Client Service: What Does Your Client Want? Art as Part of Science and Engineering Education? Collaboratively and Creatively Solve Problems, Pursue Opportunity, and Create Your Organization's Future: Use Both Sides of the Brain. Click here for a detailed description. Fluoride Panel: To Fluoridate or Not to Fluoridate? Webinars—seminars over the “web”—use the internet and a telephone conference call. 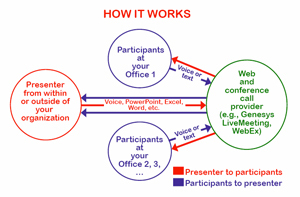 As shown in the following graphic, a presenter at any location speaks to and interacts with participants in many other locations. Usual education and training benefits, as noted above. Content tailored to an organization’s needs, terminology, and vision-mission-values. Presentation materials and tactics can accommodate verbal, visual, and kinesthetic learners. Variety of uses such as seminars/workshops, introduction of new services/personnel/partners, and working on reports/proposals/statements of qualifications (SOQs). Participants can receive hard copy of presentation as a “take away” and the event can be recorded on a CD for reuse. Participation is independent of global geographic location. No capital expenditures—use existing computers, software, and telephone system. Low cost per participant compared to typical off-site events. Webinars typically have very low per-participant communication system costs. Presenter (internal or external) preparation, presentation, and follow-up are the major costs (not the communication system, downtime, or transportation—no one need go anywhere except to the nearby conference room). Presenter and participants do not see each other live. This tends to depersonalize the event and some participants may have difficulty paying attention. Lack of “face-to-face” contact can be largely offset by means such as inviting pre-webinar input (e.g., questions, concerns, suggestions), encouraging participants to use the webinar chat feature, conducting real time polls, facilitating simultaneous breakouts at participating sites, and inviting follow-up emails and telephone conversations. If any of the listed topics, or variations on or combinations of them, resonate with your needs, please contact me for a personal consultation (Tel: 219-242-1704 or email: stuwalesh@comcast.net). Tailored education and training can effectively address knowledge, skill, and attitude deficiencies in public, private, academic, or volunteer organizations. Challenging issues can be resolved via facilitation, mentoring and coaching, and tutoring and teaching. Also, consider what might be the most cost-effective approach, that is, face-to-face or webinars. Maybe you want to raise the bar even higher and consider creating a corporate university or institute. I have helped organizations do just that and am confident that I could assist you. Contact me. Finally, regardless of how you approach education and training, please make optimum use of personnel within your organization. Every public, private, academic, or volunteer entity that I have worked with has at least a few individuals who are both experts and effective presenters. You probably have such experts who can provide tutoring and teaching in areas such as goal setting, time management, ethics, writing, speaking, difficult behavior, team essentials, marketing model, project planning, scope creep, quality control, quality assurance, liability, Critical Path Method, and Earned Value Method. 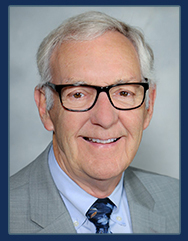 I can help you facilitate their active participation in your education and training program.